The glide slope antenna consist of 6063T6 ultra corrosion resistant architectural anodized aluminum alloy and marine grade stainless steel mounting hardware. The antenna is supplied with international orange color powder coating finish. 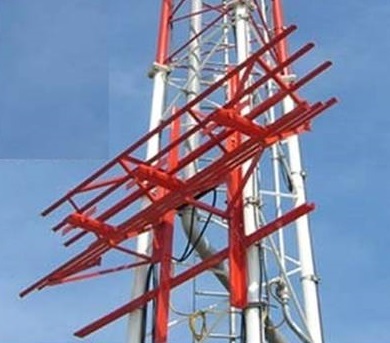 The assembly consists of number of collinear dipoles mounted in front of a corner reflector, which together form the shaped horizontal and vertical patterns of the antenna. Radiating elements are sealed in fiberglass rarome to minimize environmental effects. The entire RF distribution/combiner system as well as the integral monitor are constructed using low loss, phase stable, semi-rigid coaxial cable which provides less sensitivity to environmental changes. Glide Slope / Path Antennas are used to provide vertical guidance to aircraft during approach and landing of an aircraft under instrument fight rules. The Glides Slope Antennas are designed to withstand 200 Km/Hr wind, temperature range of -40oC to 70°C, and 95% humidity. All elements are sealed in fiberglass enclosure. The GSP series glide slope/path antennas has been designed and manufactured by us to provide highly accurate guidance information to an approaching aircraft while permitting increased flow of aircraft traffic in the vicinity of the GP tower. Please contact us for complete technical datasheet in .pdf format.